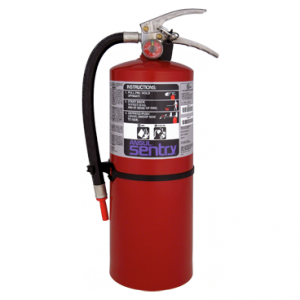 Similar to the multi-purpose uses of a regular dry chemical fire extinguisher, an industrial dry chemical fire extinguisher also protects against a number of common hazards. However, the unique combination of specialized coating and paint on the cylinder makes the industrial dry chemical extinguisher a better choice for corrosive and more industrial environments. These units may be most useful in the chemical industry or marine environments. Chemical storage areas, marinas, spray paint booths, and welding areas are only a few of the many uses for these types of extinguishers. These units are rechargeable and manufactured with high quality, durable materials.